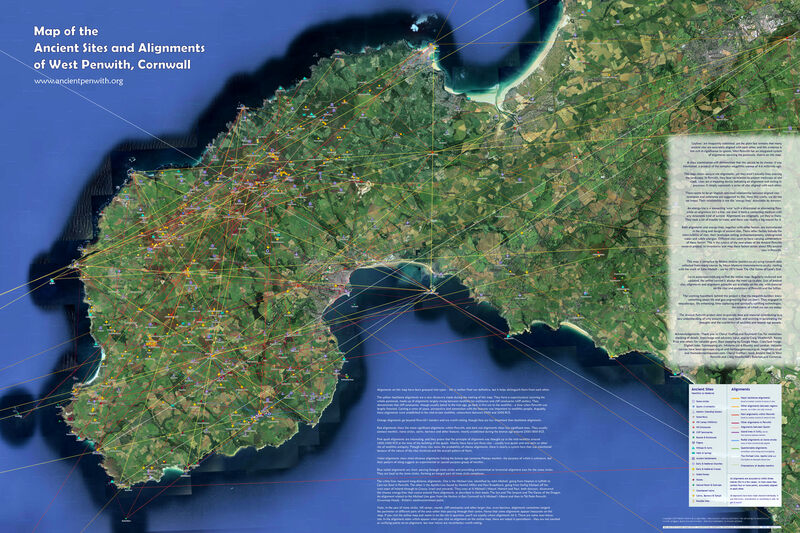 This page outlines issues that needed consideration in the making of the West Penwith map. Old churches (early medieval in foundation) and early Christian oratories and crosses (many of which are located on older ancient sites). 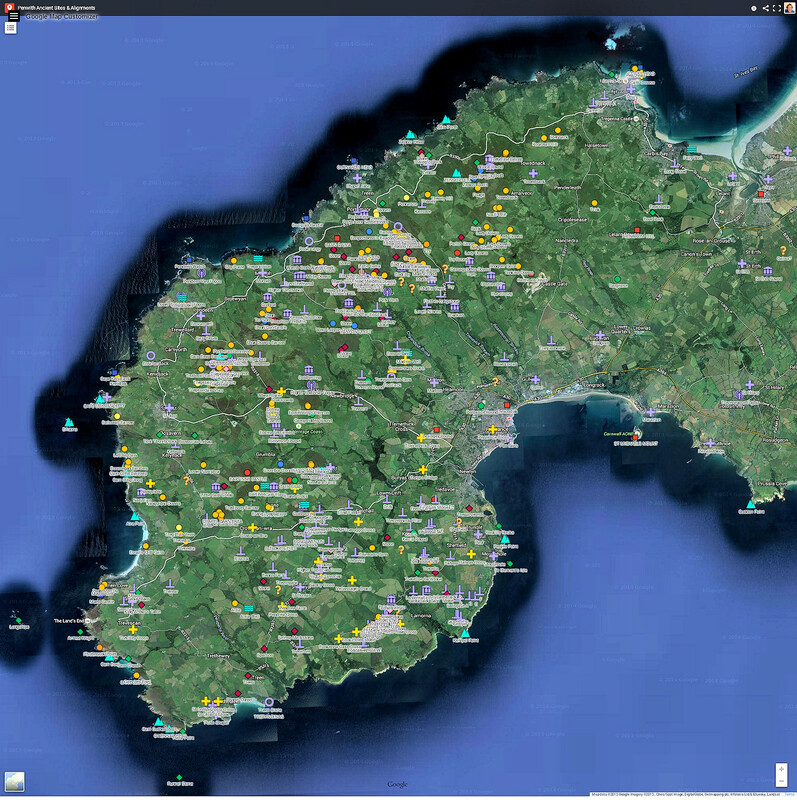 All known locations in Penwith, around 500 of them (list here), have been accurately placed on the map – you can zoom in close on the Google version of the map to examine their precise locations. Some sites shown on the map are no longer in existence - they have been included as a result of researching records, excavations and other means. Many alignments had already been found over the last 50 years by a variety of researchers, most notably John Michell and various contributors to the local prehistory journal Meyn Mamvro. These were all triple-checked, and a number were discarded as a result. All alignments, both established and newly-discovered, were triple-checked by the mapmaker, Palden Jenkins, the alignments list-keeper Raymond Cox and Cheryl Straffon, editor of Meyn Mamvro. In identifying alignments, inaccuracies of alignment of up to only three metres were accepted. 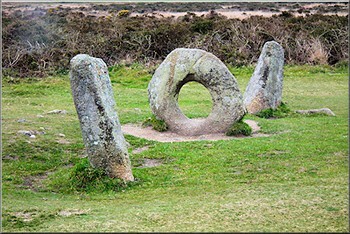 There was occasional acceptance of five metre inaccuracies in some cases where major sites (such as stone circles or neolithic tors) were involved. That’s a tight accuracy standard. To have four or five sites aligned like this over several or many kilometres is no accident, no matter what sceptics might say. To qualify as an alignment there must be a minimum of four points accurately located on it. Some geomancers would accept no less than five points - this rule exists mainly to answer sceptics' doubts by significantly reducing the statistical probability of alignments being randomly coincidental. Ancient megalith builders were not, however, worried about pleasing modern reductionist rationalists. Here in Penwith, omitting four-point alignments would miss much potentially valuable data. So four-point alignments are accepted in this research project as long as they are plausible in terms of the ancient sites they link together. the Kemyel/Swingate group of menhirs just east of Lamorna, a localised sub-system of menhirs, erected seemingly for a special purpose that we’re yet to discover. Many are mutually aligned as three-point alignments. If you examine these various instances on the map, you’ll probably see why this decision was made. Apart from these, all alignments have four or more points on them - many of them more. These are not alignments in the classic sense, but when you're out in the landscape they are highly relevant. This concerns the intervisibility of ancient sites - many sites are deliberately placed so that they can be seen from other sites, and some sites are placed because, at that precise spot, other sites can be seen from them - sometimes this is quite miraculous. To take an example, stand on top of Trencrom Hill, and Godrevy Head and St Agnes Beacon up the north coast of Cornwall, Carn Brea, Godolphin Hill and Tregonning Hill in East Penwith and St Michael’s Mount southwards in Mount's Bay simply yell at you unavoidably - they're very visible from Trencrom, drawing attention toward themselves. These are an important element of the landscape psychogeography of Trencrom Hill and, in some cases, they form astronomical alignments - that is, to the rising or setting points of the sun and moon at certain critical points in time such as the solstices and lunar maxima. From Trencrom, the summer solstice sun rises northeastwards over St Agnes Beacon, and the winter solstice sun rises southeastwards between Goolphin and Tregonning Hills. Meanwhile, the summer solstice sunset sets northwestwards in a nick between Trink Hill and Rosewall Hill to the northwest. Similarly, if you stand at Chûn Quoit at summer solstice sunset, you'll find that the sun sets in a nick in the rocks of Carn Kenidjack. This is not uncommon, and it can involve wholly natural sites. The summer solstice sunset mentioned above, as seen from the central tor rock on Trencrom Hill, is seen to roll exactly down the slope of Trink Hill until it sets behind Rosewall Hill. Prominent hills are important as a focus of attention. They give a sense of 'placeness' and orientation. Carn Kenidjak and Carn Galva in the north of the peninsula, and Chapel Carn Brea and Bartinney in the west, are dominant in the landscape, not just visually but also in terms of psycho-geographic presence. You definitely notice them. Carn Kenidjack is not actually very high, but it is nevertheless outstanding, sometimes from the most unexpected of places, including the Isles of Scilly. At Carn Lês Boel, six miles (12km) south of Carn Kenidjack, if you stand on a particular tumulus just off the carn (map ref SW 3578 2331), you'll see Carn Kenidjack - but move just a few paces away and it disappears from view. This is just classic. However, these two-point lines of sight are not counted as alignments - they are simply intervisible sites, hills and landscape features. A survey of intervisibility will be carried out in coming years and a map will be prepared to show which sites are visible from which. They are mentioned here because, in the field, they are an important part of the spatial geomancy of West Penwith. Originally, ley-hunters worked with Ordnance Survey maps laid out across the floor, and long rulers and pencils. Nowadays we use Google Maps, based on aerial photography - in which case, the very exact location of a site (such as a menhir or stone) can be identified accurately, and the full extent and shape of a barrow, enclosure or stone circle can be seen - since some alignments tangent their edges rather than going through the centre. The research was done both logically and intuitively. Operating logically, one can identify a site and swing a line round from it to look for alignments to that site - this can be done systematically around a large number of selected sites. Operating intuitively is more of a spontaneous pursuit, done when the thought arises or while working on the map. 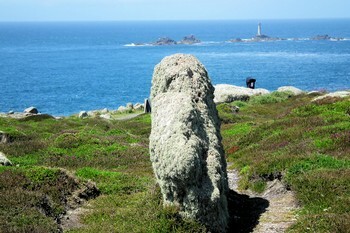 An example: musing that St Michael's Mount and Cape Cornwall have similar shapes and settings, the author played with a long ruler over his computer screen and, lo behold, an alignment appeared involving four sites - one of which (Botrea Barrows) was perchance on the hill above the author's home. It was this that led to the discovery of the backbone alignments. And that is how some of the best discoveries in this project have been made, intuitively, often over a cup of tea. The first alignments to be added to the map were those found by John Michell around 1970 - around 80 of them. Then others that had been found by other researchers, logged by Meyn Mamvro, were added. Then further work was done to research new ones. As this process proceeded, it became clear that a jumble of alignments was forming, and that they seemed to be of differing levels of importance - depending on the sites involved, the number of sites on an alignment and various considerations such as the alignment's plausibility, judged in terms of topography or site antiquity. Thus began a process of grouping alignments into types. Some alignments were relatively simple to group together: backbone alignments, alignments passing outside West Penwith, local systems such as at Kemyel or the radials from stone circles, and Scilly alignments. Others were more difficult - mainly alignments of seemingly greater or lesser importance, which are shown on the map in two shades of red and with differing thicknesses of lines. This grouping is not final, and specific alignments are reviewed periodically. All alignments have been numbered and listed in the alignments list, with the map references of all points on them. These and other details can also be found on the Google version of the map, by clicking on the line or on any point - details then pop up.